I'm always somewhat skeptical when I see recipes that claim to be "just as good as store-bought", not that homemade isn't often better than store-bought, but it must be the inner skeptic in me that doubts it when it comes to snacks like granola bars. My husband has a crazy work schedule, often not getting his "lunch" break until almost 4pm, so that necessitates snacks throughout the day so he doesn't end up passing out before lunch! Granola bars are a staple for him, mostly because they usually contain enough protein and fiber to fill him up and give him a little energy boost, plus they're fantastically portable. 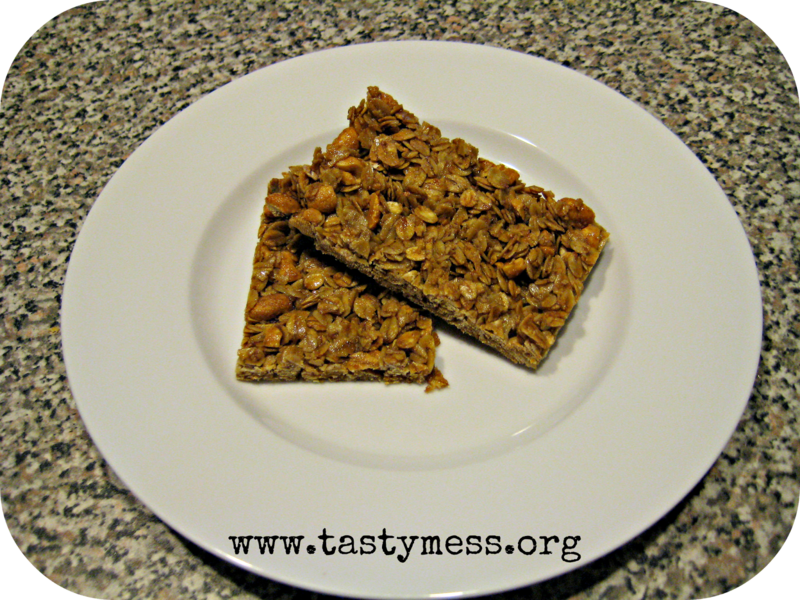 However, in our laid-back quest to start cutting back some of our processed foods (processed lunch meat was a big culprit, check out my solution here), I decided to try my hand at baking granola bars at home. The resulting recipe is my 3rd attempt and I think I finally have it exactly the way I want it. The first batch was good in flavor but too thick, so the bars didn't crisp up and hold together well. The second batch had the right consistency but I accidentally overcooked them so they weren't a great result either. This final batch is a great blend of flavor from the honey and the toasted oats. You can swap in any nuts you want or leave them out if you want, the result are super-simple oat-based granola bars that last in a zip-top bag for 2 weeks! You can also add in dried fruits (which my husband hates) like cranberries or raisins with tasty and chewier results. This recipe is easily doubled if you have the pans (I don't) to make more at once too. My favorite combination has been with dry-roasted peanuts as the featured nut, but for a healthier option I mostly go with almonds, which are still delicious. What processed snacks could use a homemade makeover in your kitchen? I'd love to hear your ideas and recipes! Line a large rimmed baking pan with aluminum foil. I use my Pampered Chef Large Bar Pan and it works really well. Combine the oats, oil and salt in a large bowl and mix until the oats are evenly coated. Transfer the mixture to the baking sheet(s) and spread into an even layer. Bake, stirring every 10 minutes, until pale gold and lightly toasted, about 20 minutes. Remove the oats into a large bowl and lower the oven temp to 300 degrees. Coarsely chop the nuts or lightly crush them using a rolling pin. Add them to the oat mixture. In a small saucepan, combine the honey and brown sugar and cook over low heat for about 3-5 minutes, stirring constantly to dissolve the sugar. Remove from heat and stir in the vanilla and cinnamon. Pour the honey mixture over the oats and nuts and stir well with a nonstick spatula until completely coated. Make sure your baking sheet is still lined with foil (no rips or tears) and spray it with non-stick spray before transferring the granola mixture to the prepared sheet and spread in an even layer. A thinner layer produces crispier bars that hold together well, so keep that in mind. Spray a large metal spatula or the bottom of a square dish with non-stick spray and firmly press the mixture into the pan. Make a flat, tight, and even layer. Bake until golden, about 20-30 minutes, but check every 10-15 minutes just to make sure they aren’t overcooking as baking time really depends on how thick the bars are. Cool in the baking sheet, on a wire rack, for 10 minutes before using the foil to lift and remove the bars from the pan. Set on the counter and let cool for another 5 minutes before cutting into bars with a very sharp knife or pizza cutter. Cut the bars all the way through in whatever sizes you like, and then allow the granola bars to completely cool. Do not wait longer than 15 minutes before cutting the bars. They harden up significantly as they cool. Any longer and you’ll have a very hard time cutting through them.